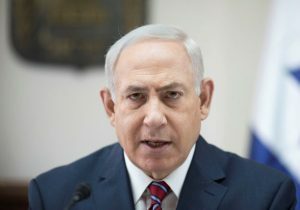 Israeli Prime Minister Benjamin Netanyahu Wednesday pledged to stand in the way of UN and international calls to uproot and end Israeli unlawful occupation of Palestinian territories. The ultra national Israeli Premier made the pledge during a speech marking the 50th anniversary of Israeli settlement in the West Bank. “Settlement is important to you in the same way that it is important to me, so I say very clearly: There will be no further uprooting of settlements in the land of Israel,” Netanyhu told a crowd in a settlement, south of Jerusalem. Around 600,000 Israelis live in Israeli settlements in the West Bank. Israel’s continued occupation of Palestinian territories has been considered by Palestinians and the UN as the major obstacle for peace between the two sides. UN envoy to region Nickolay Mladenov told the UN Security Council Monday that Israel has failed to comply with the Council’s request for a halt to all settlement activities. Mladenov noted that the unlawful policy undermines the UN approach for two-state solution. Netanyahu told his listeners that uprooting the settlements has never brought peace but rather more violence. The Israeli leader was referring to Israel’s pullout from Gaza in 2005. Hamas following the pullover won Palestinian legislative elections of 2006, taking control of the Strip. The speech came just one day after a 37-year old Palestinian killed three Israelis namely one border police officer and two security guards, in a shooting at the back entrance of the settlement of Har Adar, in the West Bank. Posted by KanelkaTagba on Sep 28 2017. Filed under Headlines, World News. You can follow any responses to this entry through the RSS 2.0. Both comments and pings are currently closed.